Ditch the pricey rice cooker. Say goodbye to sticky, clumpy, burned...(insert your woe)...white rice forever. We’ve got 2 ways for you to cook the perfect pot of rice. You Pick – the Chinese ‘secret’ to good-eating, fluffy rice or perfect, simple rice from Cook’s Illustrated magazine. In a pot over medium heat, melt the butter or add the vegetable oil. Add the rice and stir for about 3 mins. until the grains become chalky. Add water and salt. Turn the heat to high and bring to a boil. Stir the contents to blend everything. Cover the pot with a tight-fitting lid. Reduce the heat to low and let simmer for about 20 mins. until all the water is absorbed. Turn off the heat. Remove the lid from the pot and place a dish towel, folded in half, over the pot. Replace the lid and let stand for 10 to 15 mins. Measure the dry rice in a jug and soak overnight. Wash, then rinse the rice really well, until the water is clear. Drain really well. 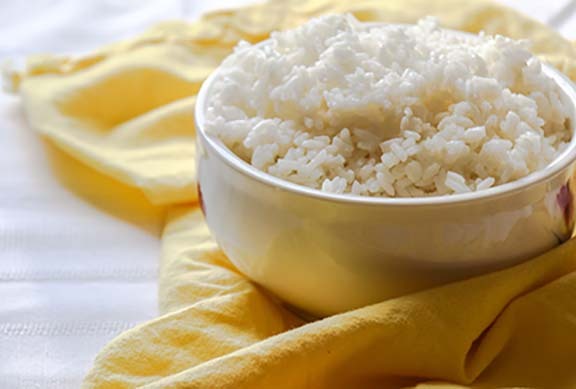 Place rice in a saucepan with 5 parts water to 1 part rice (plus a little salt) and stir once. Bring to the boil, then turn the heat all the way down and cover the pan tightly with a lid. Cook on the lowest heat possible for 10-15 mins. with the pan closed. Use a fork to fluff up the cooked rice.